Powered by a Corvair engine and transaxle. 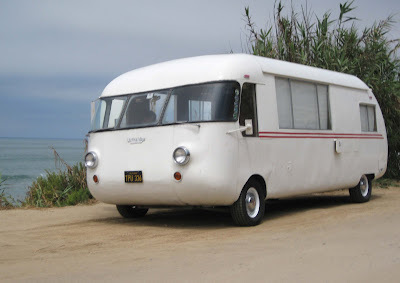 A true monococque, these were designed and built by an aircraft engineer in in the early 60's. Amazingly, they weigh in at just over 2 tons. Labels: 60's, American, Corvair, Motorhome, Submission, Ultra Van, What Year? There's one going to pot in a storage yard between Hershey, and Elizabethtown in PA.